Research refutes famous study, shows neurons created through exercise don’t erase old memories. Exercise is well-known for its cognitive benefits because it causes neurogenesis, the creation of new neurons, in the hippocampus, which is a key brain region for learning, memory and mood regulation. Therefore, it was a surprise in 2014 when researchers found that exercise caused animals to forget what they’d already learned, stunning the field of hippocampal neurogenesis. Now, a study from researchers at Texas A&M College of Medicine shows that exercise causes more new neurons to be formed in the hippocampus, and contrary to the earlier study, these new neurons do not cause the individual to forget old memories. The team state that their findings show running exercise does not impair memory recall ability in a rat model despite substantially increasing neurogenesis. Previous studies show that the animal models used in the 2014 investigation showed far more neurogenesis than the control group and these additional neurons appeared to erase memories formed before they started the exercise regimen. The extra neurons were then removed, and the mice regained the ability to remember again. This suggested that the mice who exercised had a large number of new neurons, which caused a break down in the old connections, making them forget what they knew. Therefore, the team decided to replicate this earlier research, using rats instead of mice, as rats are thought to be more like humans physiologically, with more-similar neuronal workings. The current shows that these animal models showed no such degradation in memories. The current study utilises rats trained to complete a task over the course of four days, followed by several days of memory consolidation by performing the task repeatedly. Then, half the trained animal models were put into cages with running wheels for several weeks, while the control group remained sedentary. Results show that the rats who ran further over the course of that time had much greater neurogenesis in their hippocampus, and all rats who had access to a wheel had greater neurogenesis than the sedentary group. Data findings show that on average, the rats ran about 48 miles in four weeks, with neuron formation doubling in the hippocampus of these animals. The team state this suggests that exercise greatly increases neurogenesis in the hippocampus, which has functional implications. They go on to explain that neurogenesis is important for maintaining normal mood function, as well as for learning and creating new memories; this connection may help explain why exercise is an effective antidepressant. Results show that despite differing levels of increased neurogenesis, both moderate runners and those who ran further than average exhibited the same ability as the sedentary runners to recall the task they learned before they began to exercise. The lab conclude that this means even a large amount of running doesn’t interfere with the recall of memory. The team surmise that their findings should provide some comfort to those who read the earlier research and worried that their run might be causing them to forget things. They go on to add that exercise doesn’t cause any memory problems, and there are many studies proving its benefits for making new memories and maintaining good mood. For the future, the researchers state that their study shows exercise does not interfere with memory recall ability, so people should keep exercising and not worry about losing their old memories. 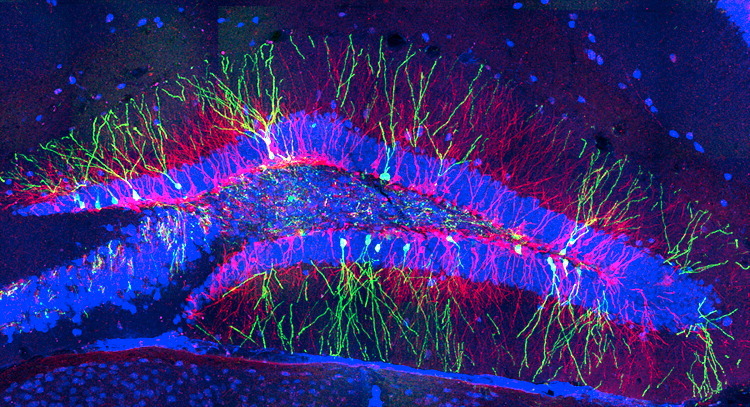 Neurogenesis in the hippocampus of a 16-week-old mouse. Adult neural stem cells proliferate and differentiate into granule cells in the subgranular zone of the dentate gyrus (red, 0–4 weeks old; green, 8 weeks old). Image courtesy of C. Zhao, J. McCall and F.H. Gage.